As if he knew something we didn't, former Secretary of State Kissinger has chosen to come out with a collection of "statements"--interviews and speeches--from his recent years out of office. The lead offering is a now-passÃ‰ 1977 speech on the evils of Eurocommunism, in which Kissinger justifies American meddling in European politics to preserve an "alliance" that at least some Europeans are no longer so comfortable with. Nestled among tributes to Golda Meir, Anwar Sadat, and Nelson Rockefeller are speeches rehearsing other big Kissinger themes, like the imperatives of "linkage" (whereby various items under negotiation with the USSR are treated in harmony instead of as discrete entities) or the iniquities of the Third World. 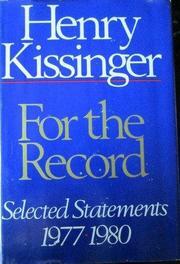 Kissinger repeatedly berates the Third World for what he sees as unjustified attacks on the US. In this regard, he brandishes the OPEC-induced rise in oil prices--which he says stifled economic development in other Third World nations--and extolls the positive benefits of multinationals. For posterity, there's also his Time article praising his friend the Shah and his Senate SALT II testimony, in which he conditionally supported the treaty. Plus: some interviews that allow him to ruminate at length on the nuances and subtleties of the "art" of foreign policy. It almost makes one nostalgic, all that reasoned pomposity. But it will do, as the title suggests, for the record.